Laranzuh is an independent first-person Point & Click / Panorama based mystery adventure game currently in development. The game takes place in the dark and gloomy atmosphere of a small town and its desolate surroundings. Soon you will find yourself in the middle of intriguing events at where you should reveal the truth lies beneath the mysterious disappearance of a girl and her family. Instead of computer-generated 3D imagery, the game will feature real photographs of the eclectic locations seamlessly integrated into the game engine with photo-realistic real-time effects. 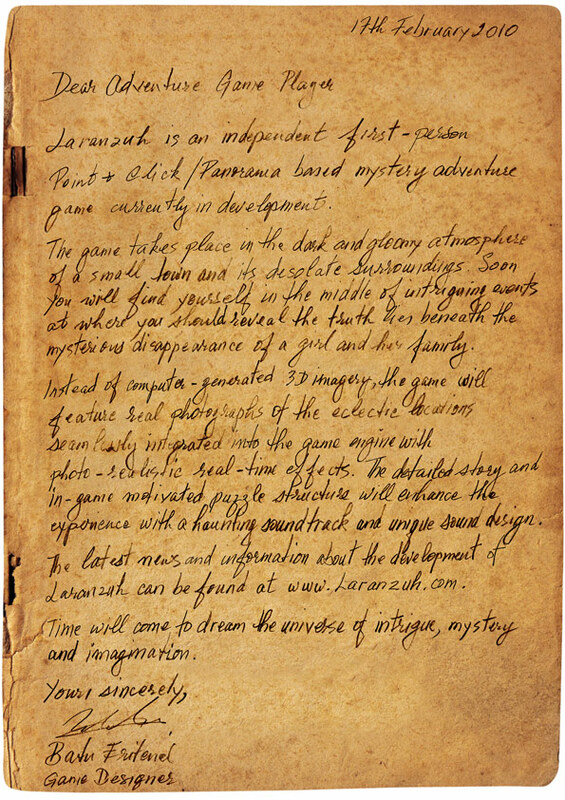 The detailed story and in-game motivated puzzle structure will enhance the experience with a haunting soundtrack and unique sound design. Time will come to dream the universe of intrigue, mystery and imagination. To download A4 - High Quality Printable Version of the Press Release "http://www.laranzuh.com/laranzuh-press-release-A4-print.jpg"
Thank you, we have considered making it using Adventure Maker but, some limitations such as lack of 3D surround sound, changed our decision. However, time may change this if there are new additions to it in the future. If that is a must, you can delete the topic, sorry. And thanks again for your comment. Yes, choosing an engine is dependent of what features you need. We are certainly interested in your game, but since the New Games Announcements section is for Adventure Maker games only, I'm going to move your topic to our General Chat. Sounds good, I'll be interested how it looks like. The story seems to be one that will surely catch my attention. Very intriguing. A lot of effort has gone into this project. Have you decided what engine you will be using to build the game with? I look forward to hearing more about your progress. I'm planning to use Unity3D, as it features 3D surround sound and it's PC, Mac, iOs, Android, PS3, Xbox and WiiU compatible. The panorama interface will be adapted into the engine. I also considered Agustin Cordes' Dagon, but as I prefer to use graphical interface and minimal coding, Unity seems suitable for now.